Keeping raw seafood fresh is no easy feat. 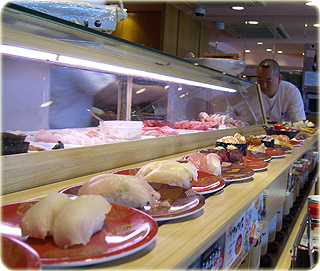 So it isn’t so surprising that is Blue C Sushi implemented RFID tools from Intermec (and Microsoft BizTalk’s business process RFID technology) to track the flow of food and automatically calculate customers’ bills. AT Blue C Sushi restaurants, customers select plates of sushi from a rotating conveyor belt that winds through the restaurant moving past every table.